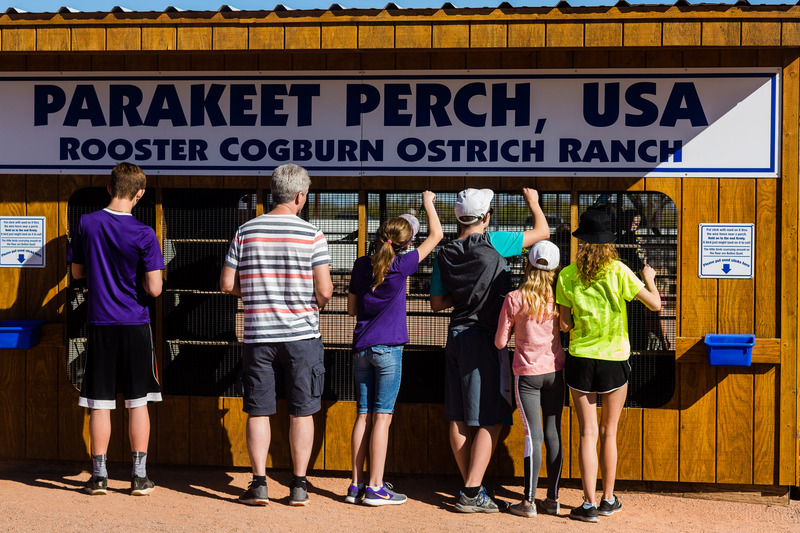 Ostrich and Boer Goats from Africa, Donkeys from the Mediterranean, Deer from Europe, Miniature Goats from Nigeria, Ducks from China, Sheep from St. Croix, Lorikeets from Australia, Stingrays from Florida, Bunnies from all over, and Redneck Owners from Oklahoma. 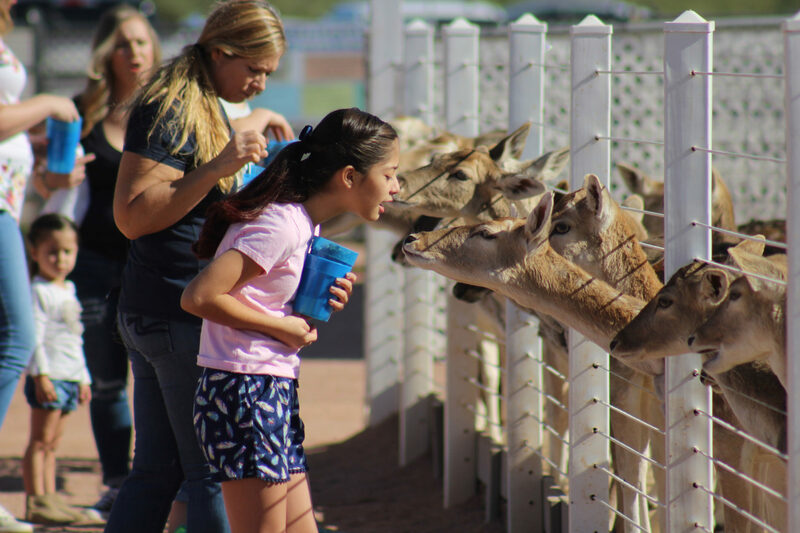 Get a hands-on and up close interaction with lots of different animals. Let’s face it – there really isn’t Ocean Front Property in Arizona so us desert dwellers can experience one of the most docile ocean critters right here. Besides, they are just really cool! 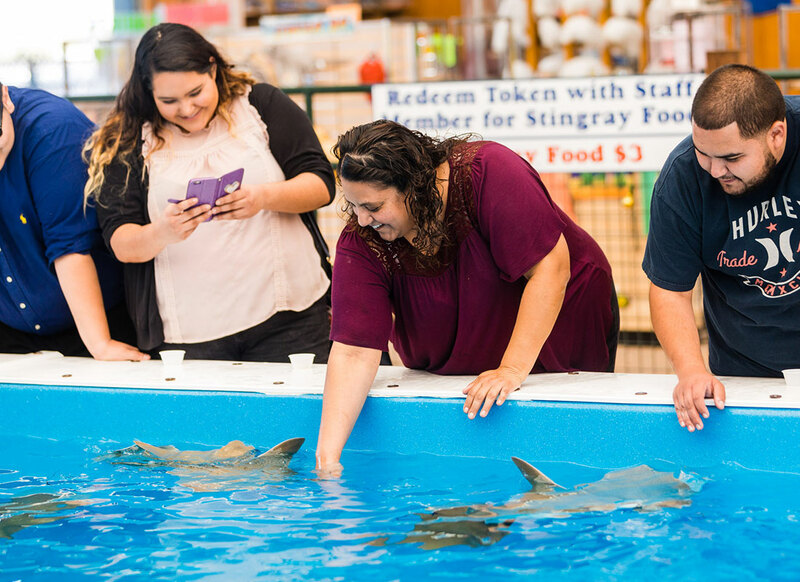 Our stingray feeding goes on constantly throughout the day so you don’t have to worry about the timing. Enjoy feeding when you make your way to Stingray Bay. 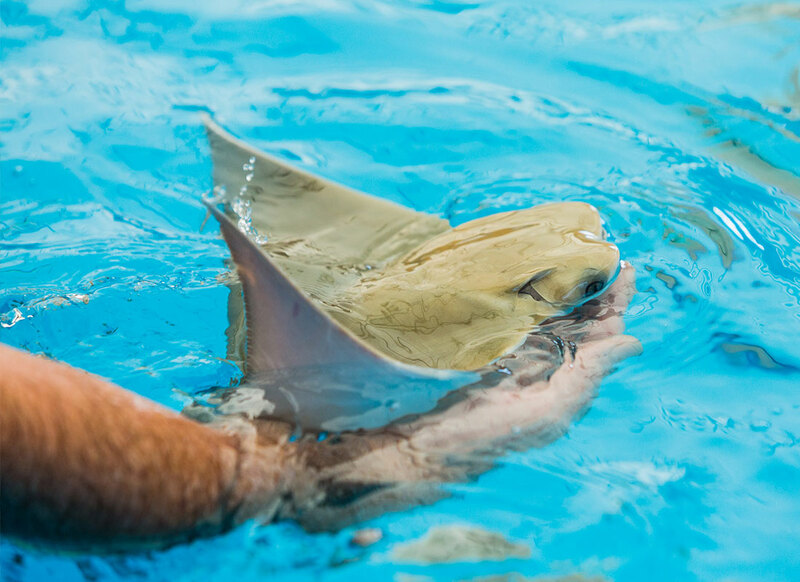 We have the friendliest rays around!!! Feed a living dinosaur right out of your hand if you are a thrill seeker! 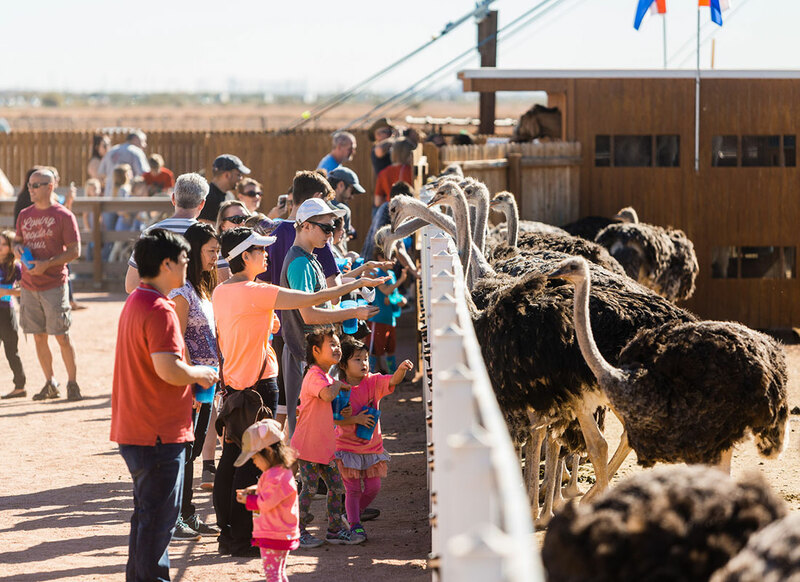 Don’t worry – you can also feed the ostrich safely through feed chutes provided or take advantage of the feeding dock for great pictures. 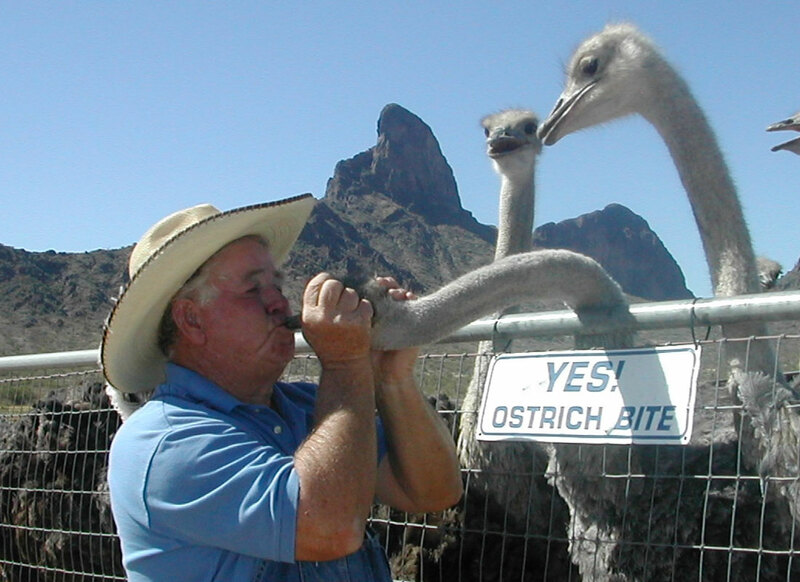 Kissing the Ostrich is not advised! Rooster Cogburn lost a front tooth doing this! The Rainbow Lorikeet Forest is a 5,000 sq. ft. tropical paradise in the desert. These beautiful birds land on you and drink nectar out of a cup you hold. Amazing experience and one of the favorite interactions. 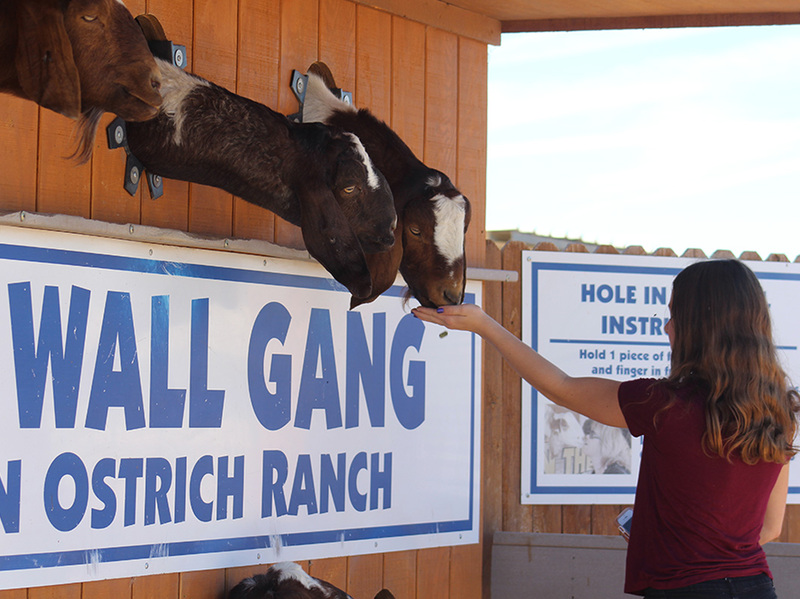 Boer Goats are the feature in the “Hole in the Wall Gang” and the “Goat Penthouse”. 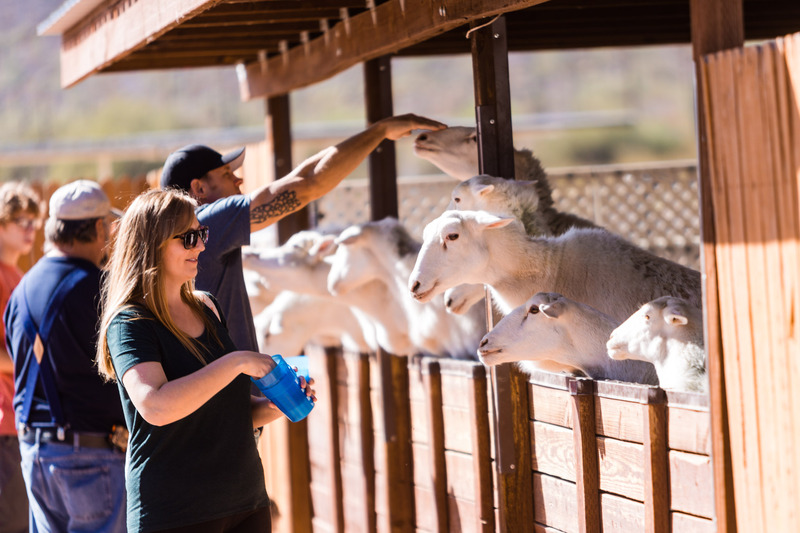 Here is your chance to race your friends to get feed to the goats waiting in the sky or get that Goat Kissin’ picture you have always wanted! The Fallow Deer eat right out of your hand. Safe and fun for even the youngest Pilgrims. They do like to lick your hand however! 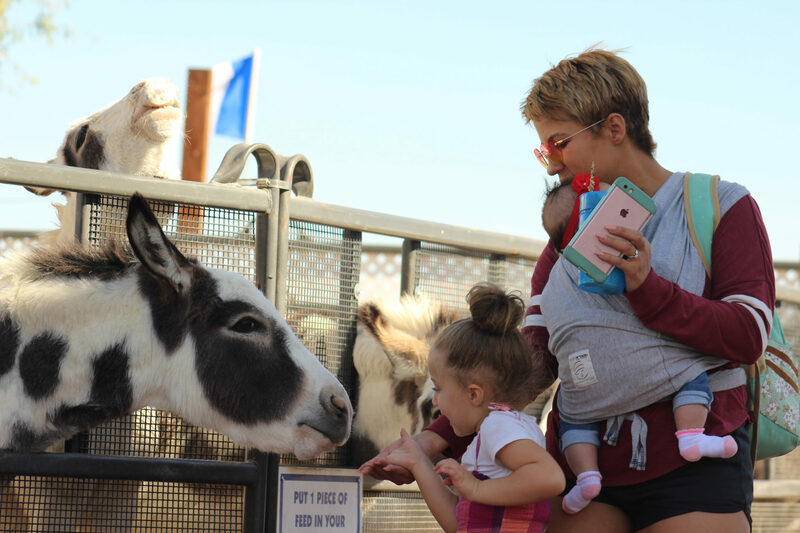 Come scratch some big ears at Little Donkey Town, USA. The Miniature Donkeys eat right out of your hand. Keep your eyes open for one of our stars, Smiley the Donkey! Our Cabbage Patch Kids are the Nigerian Dwarf Goats. Feed them in their very own playground. 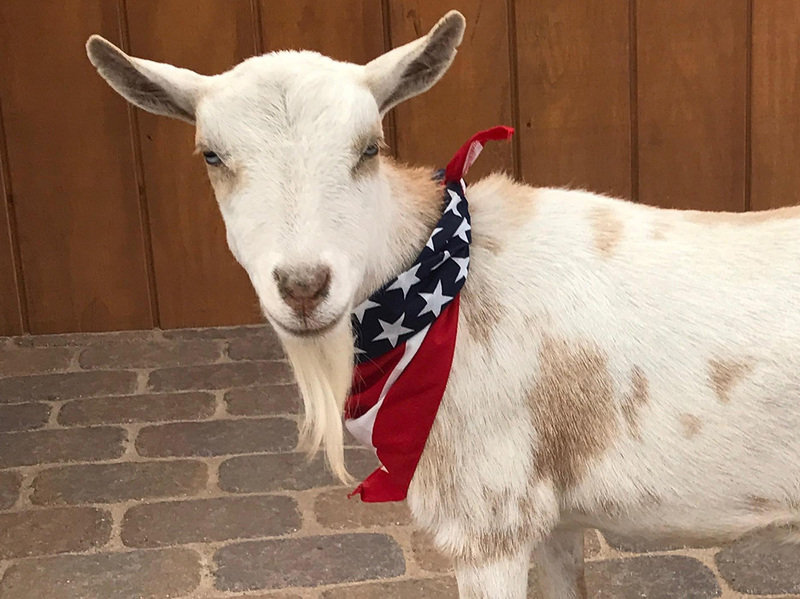 Watch out for Sherbert, our escape goat, as she wanders around the ranch looking for new friends. Quackville, USA is home to Pekin Ducks. 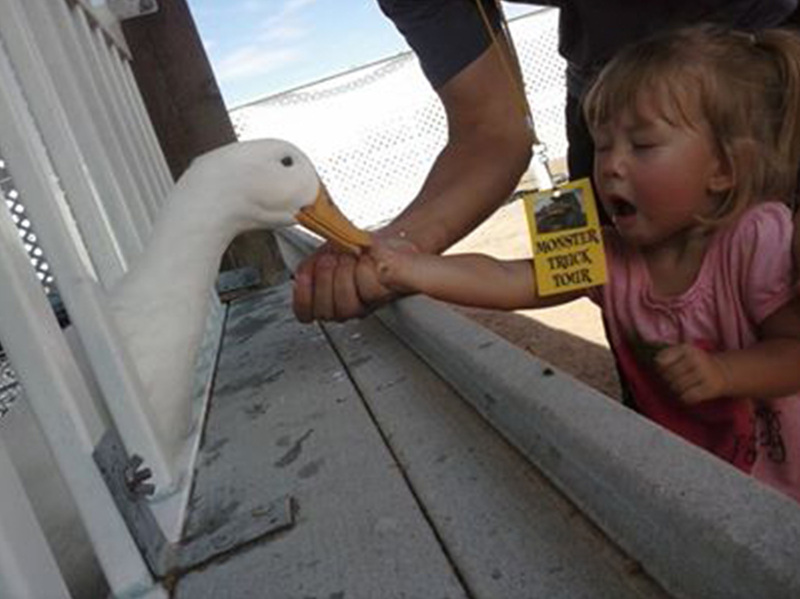 Everyone has fed ducks but not too many have done it out of their hand. If you have the courage to try it you will go away laughing hysterically. Don’t worry – they don’t have teeth! Who could have a BAA BAA bad day when these adorable sheep jump up on the wall to greet you? 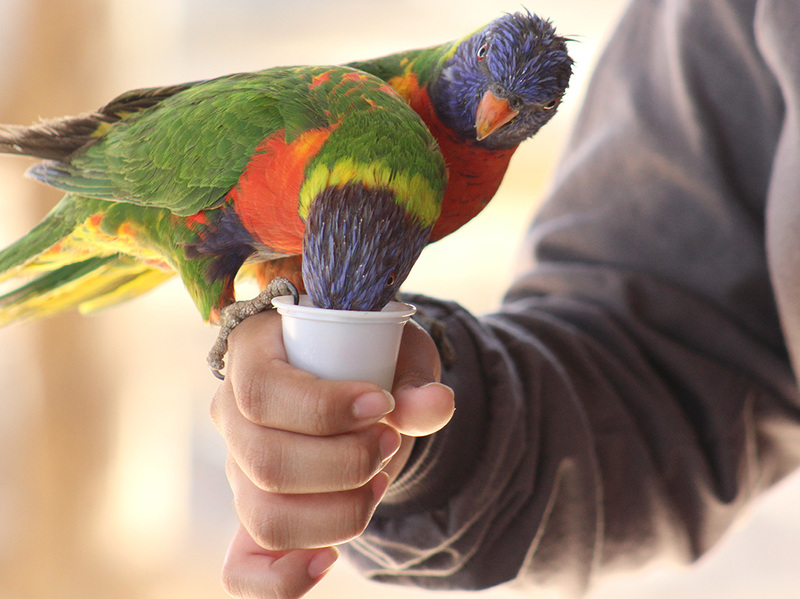 Enjoy feeding the parakeets without being in the enclosure with them. Perfect for those folks that are a little uncomfortable with birds sitting on their head. 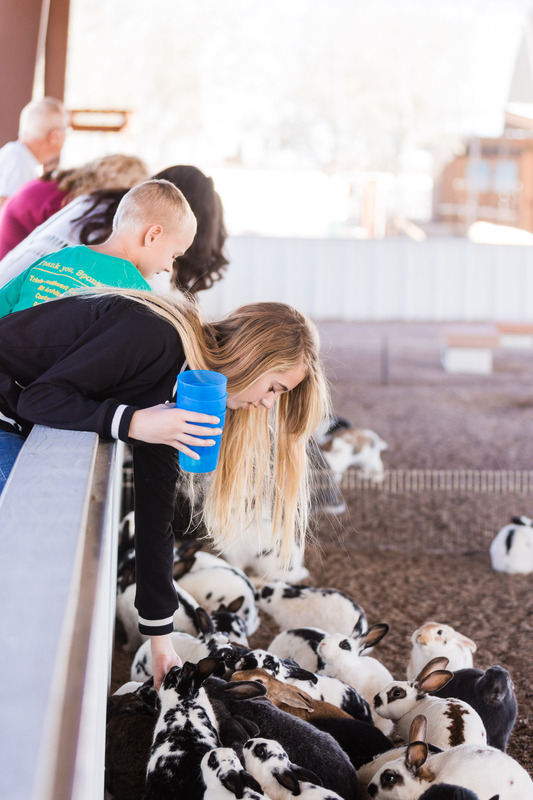 Hurdles are no problem for our bunnies as they hop over to greet you for some hand feeding. This will surly warm the heart of all ages. 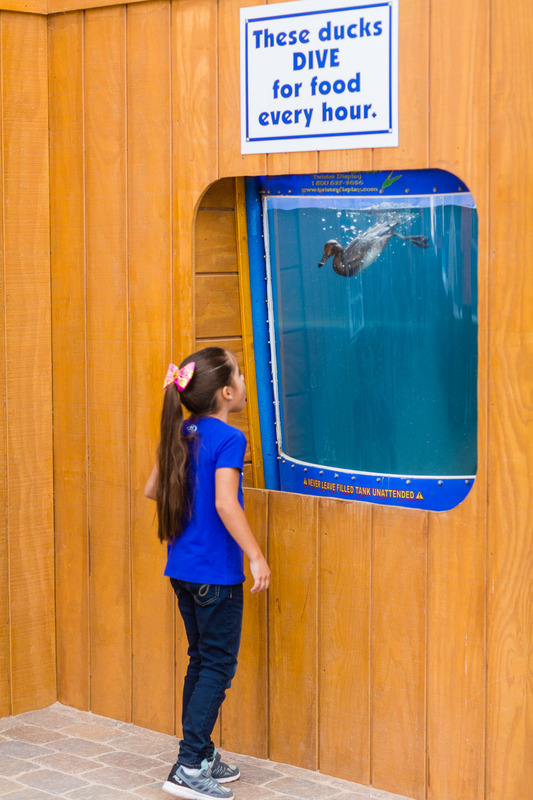 Hold your breath when every 15 minutes our ducks diver to the bottom of the tank chasing food.